Getting started with meat rabbits! Meat rabbits are a wonderful livestock to own. Easy and budget friendly; rabbits may be the perfect backyard homestead livestock. Today I’d like to give you an intro into meat rabbits…a meat rabbits 101. Rabbits are a nearly perfect small livestock. Getting started with meat rabbits is budget friendly. You can start with a trio (2 does and 1 buck) and 3 single cages or a 3-tier cage system. This trio can keep your freezer filled all year long. Rabbits make nearly zero noise; especially happy rabbits that have clean food, water and den. Your HOA will never know you’re raising a meat source unless you tell them! Rabbits need very little maintenance. Keep their dwelling clean, plenty of water, food and some chewing wood; they are pretty content. Meat Rabbits – How Many? 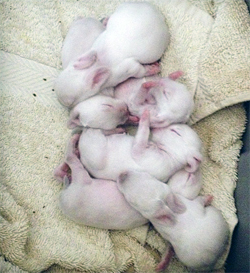 One of the great things about rabbits is that the are prolific breeders. So you need to ask yourself how much rabbit do you want to eat each week and how many people will you be feeding. A breeding trio with 2 does and 1 buck can produce up to 600 pounds of processed meat every year. Now you don’t have to breed them this heavily if you don’t want that much rabbit in your freezer but I wouldn’t recommend having less than a trio as a starter rabbitry. But before you run off and get more, consider how much time do you want to take cleaning out cages, feeding and watering your rabbits. A trio is relatively easy but the more rabbits…the more work. There are a lot of choices when it comes to breeds. You have breeds that are smaller and breeds that are bigger. Bigger seems better but bigger rabbits eat more too. What I want is a big rabbit with an early growth spurt, like an American Blue. They get bigger faster and have a great meat to bone ratio. I talk more about my favorite breeds in The Top 10 Meat Rabbit Breeds. When you’re getting started with meat rabbits you’ll need to choose a housing option. There are 2 basic thoughts on housing meat rabbits: cages and colonies. Each have their pros and cons and we ultimately went with cages with “free time” for the rabbits either in the backyard or in the house. We are able to do this because our rabbitry is small. Protects your breeding integrity (aka – you get to decide who breeds with who and when). Less parasite issues. Keeping them off the ground limits their exposure. Rabbits can handle temperatures by digging their own burrows and using natural shade (this can really help in warmer climates). But can also help to keep kits warmer in cooler climates. You will need to make plans for grow-outs so they are not getting pregnant or impregnating too early or in-breeding. You’re going to have parasites. So you’ll want to treat rabbits before you eat them. That means getting them off the ground, treating them and then waiting on said treatment to leave their systems before processing. We started with Hostile Hare cages and still do. While I like the “free range” rabbit idea of colonies; we don’t have the space for that and the parasite issue just gives me the willies. I do think that if you choose cages you should consider making them a comfortable space (toys, chews, a tile to get their feet off the wire, etc). There is a lot to consider when feeding a meat rabbit. The first being that you are consuming them…quality matters. Pellets are a great option. They are inexpensive, a complete nutrition for the rabbit and easy to feed. 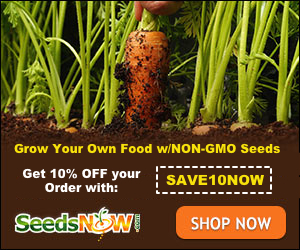 But I have been hard pressed to find an affordable organic / non-gmo pellet; which is important to me as a consumer. Right now we’ve come to terms with our pellets and supplement with rabbit-safe weeds, garden goodies, oats and black oil sunflower seeds.
. I haven’t found a better source on feeding meat rabbits without pellets. I’m still working towards this goal! Rabbits are known for their breeding for a reason. Generally rabbits breed easily and often. But there are some points you should be aware of. Rabbits are NOT monogamous. One buck can “service” 6 – 8 does…but not in the same day. But it is a good idea to have more than one buck to keep your breeding program healthy and free of in-breeding; especially if you keep any of your kits for future breeding. You can inbreed…but I avoid it for the long term health of the rabbits. 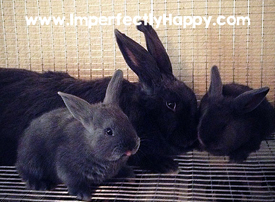 You’ll find in-breeding will bring out the faults of your rabbits rather than their strengths. it doesn’t make them good mothers”. It is better to allow a doe to fully mature, get to her full weight / size and then breed her. Bucks, if they seem interested can breed as early as 4 months. BUT they can’t generally handle a full grown doe. However sometimes their stamina makes up for their lack of style…………………………….yeah, I went there. You’re going to hear a lot of different opinions about how often to breed a doe. We don’t breed them until they have weaned their litter and sometimes not until 2 weeks after. She’s worked hard. She needs time to recoup, get her weight back on, then she’ll be a better mom to the next litter. I hate to see a doe over bred; she won’t last long. We leave our kits with mom for 6 to 8 weeks. Then they are in grow-out pens (separate does and bucks if you can) for 2 – 4 weeks. We want them to get to a good weight before growing slows down. Some people feel like 8 weeks a enough time but I find that the 10 – 12 week mark offers a lot more weight. Processing, well it isn’t without mixed feelings. If you like it, that is a separate issue. But the fact is that if you are a meat eater and you want to be more self-sufficient then you’re going to need to get comfortable with it. If your spouse is going to do it, I still suggest you do at least once – you need to know how to do it. Methods for Processing: Do it right, do it quickly. There are a ton of videos on YouTube that will walk you through dispatch and preparing your rabbit for the freezer or oven. But if you can find someone who will walk you through it, hands on, do that. The best way to learn this is from someone right there, walking you through it. A scared or hurt rabbit will scream. You won’t find that on a lot of blog posts, but that’s the truth of it. I’ve never had one scream. We spend time with them, they are used to being handled. We make the process quick. You can’t 2nd guess yourself in the middle of it or they’ll suffer needlessly. Broomstick – This is the least expensive method. It is effective and done correctly will be a quick death for your rabbit. Is is basically an internal decapitation. Pellet Gun – A bit of an investment but a little more hands off. Hopper Popper – Same idea as the broomstick method but uses the weight of the rabbit to break the neck. Bolt Gun – Really quiet and quick. No bullets or pellets required. 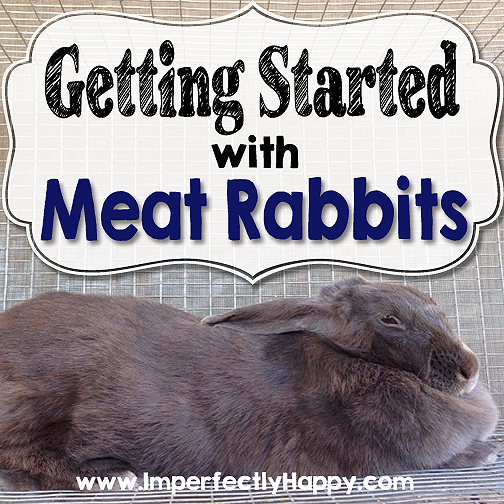 Getting started with meat rabbits doesn’t have to be difficult. In fact they may be the easiest livestock you ever raise. There is a lot of bang for your buck! Thank you for this guide, it has been one of the more informative I’ve read since I’ve started researching this topic. I do wonder if you could possibly provide more information about the issue of parasites in rabbits that are allowed outdoors. Since my husband and I have started discussing raising rabbits, we intended to build them an outside enclosure, but this is the first time I have actually read anything about the danger of parasites. When I went to look more into the issue, I could not find much specifically about how outdoor/colony rabbits get parasites, not even from people raising rabbits for consumption who had them in outdoor/colony situations. All I could find was a detailed guide on how to determine if your rabbit has a parasite and what to do about it, but nothing about prevention or the types of parasites rabbits are more likely to become infected with depending on their living situations, etc. Some parasites are reported as easily treatable and not particularly problematic, while others sound like they could threaten the entire colony, but I could not find any information on if they were preventable or particularly common and so on, which would obviously influence our decisions and plans for moving forward with our project. If you had more information about parasites you could possibly share I would be very grateful.